In the 1970’s second sourcing was the name of the game. Processors that had no additional source available often struggled in the market. Designers wanted to ensure that if they invested in designing a product around a chip, that chip would remain available if the original manufacturer of it had issues. It also helped drive down pricing, as often second sources could compete on price with the original manufacturer. By the 1980’s second sourcing had begun to end. It did still happen, but began to take the form of fabless semiconductor companies today. A company would create a design and then license its manufacturing to other companies. National Semiconductor was a popular second source for many processors of the 1970’s, notably Intel’s 8080, MCS-48 microcontrollers and AMD’s 2901. For their own designs, they rarely second sourced to anyone. Such designs as the PACE, SC/MP, original COPS and NSC800 were exclusive to National. In the 1980’s they did have TI make a very limited amount of 32k processors, likely due to some of the reliability problems National was having in making them themselves early on. So it is a bit surprising that they licensed the COPS II to Western Digital in the early 1980’s. 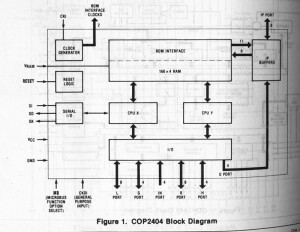 The COPS II (later just called COPS) was the 2nd generation COPS 4-bit microcomputer made by National. It was a NMOS design, designed for basic control oriented applications to replace the PMOS COPs from 1976. 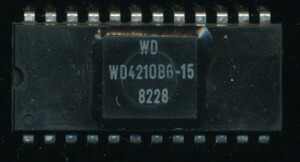 Western Digital already had the 4-bit CR1872 PMOS processor, as well as the CP1611 16-bit design. Perhaps WD saw the COPS as a filler between those. It certainly didn’t replace the CR1872, as that design continued to be marketed up until the mid-1980’s. Western Digital made the WD4200 and WD4210 as copies of the National COP420 and COP421. Also made was a WD4020 copy of the COP402 (the ROMLESS version used for dev work). The WD4200 and WD4210 are nearly identical to each other. The 4200 comes in a 28-pin package while the 4210 came in a 24-pin package. WD (and National) called this a bond-out option. The die is the same in both, the 4210 merely has one 4-bit input port left unconnected (IN0-IN3). A 24-pin package was enough less expensive than a 28-pin package to make this a viable sales option. Using a bulk NMOS process the die itself was a fairly insignificant cost compared to packaging and testing. The smaller package also was useful for smaller board designs. The practice continues today with features on processors and MCU’s disabled/enabled to expand a product line and/or make use of die’s with defects. WD continued to produce the COP line until at least 1983. Western Digital was moving its focus to the storage market, and away from te general purpose processor/microcomputer market. This brought an end to the WD4200 as well as WD’s other processors. Today WD is known for hard drives, and remembered for their disk controllers. that they second sourced a 4-bit design from National has faded to the annuls of history. In August we detailed the COP2404 and the COP400 line of 4-bit microcomputers by National Semiconductor. This NMOS design originated in 1977 and was made for over 30 years. It, however, was not the the first COP line of National Semiconductor. In fact the COP400 family was referred to as the COPS II for a brief period in the 1970’s. If the COP400 was the second in line then what was the ORIGINAL COP microcomputer? That would be the COPS I of course, better known as the MM5781/2 and its derivatives, the MM5799, MM57140 and MM57152. These microcomputers were released in 1976 and were made on a volume PMOS process. They were designed to be inexpensive and simple to use. The design of the 5781/2 actually started with the MM5734 which was a single chip accumulating calculator chip. The differences are not as big as one may think. A multi-function calculator with memory needs an ALU, registers, ann accumulator and instruction decoding, as well as very limited memory and fairly extensive I/O (to run the display and read inputs from the keyboard). National saw this as an opportunity to capture a bit of the low-end market. They already had the IMP-16 for their high end, the SC/MP for the mid range, as well as second sourced Intel MCS-4 and MCS-80. What they lacked was something to compete with the likes of the WD1872 and the TI TMS1000 series as well as the rise of the Japanese 4-bit solutions from NEC, Toshiba and Sanyo. 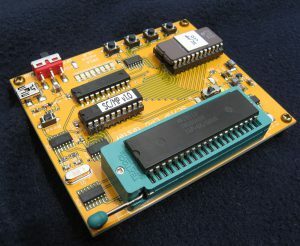 The 5781/2 was a 2 chip solution, together they formed a microcomputer. The 5781 contained the program ROM (2048 x 8 bits), as well as the program counter and some control logic. The 5782 was contained the full ALU, the accumulator, the instruction decoder, and 160×4 bits of RAM. It could execute 33 different instructions. Clock speed was 70-400KHz and was provided by an off-chip oscillator. National combined the 5781/2 into a single 28 pin chip called the MM5799. It contained all the logic of the 5781/2 but with a smaller amount of RAM (96 x 4 bits) and ROM (1500 x 8 bits). Clock speed remained the same but the instruction set was expanded slightly to 41 instructions. Two other versions were also made that had more extensive I/O. The MM57140 which had build in LED drivers, and the MM57152 which was the same, but had built in fluorescent display drivers (this was the 1970’s after all). The ‘140 and ‘152 had 36 instructions 55 x 4 bits of RAM and 630 x 8 bits of ROM. Maximum clock speed was also reduced to 280KHz. 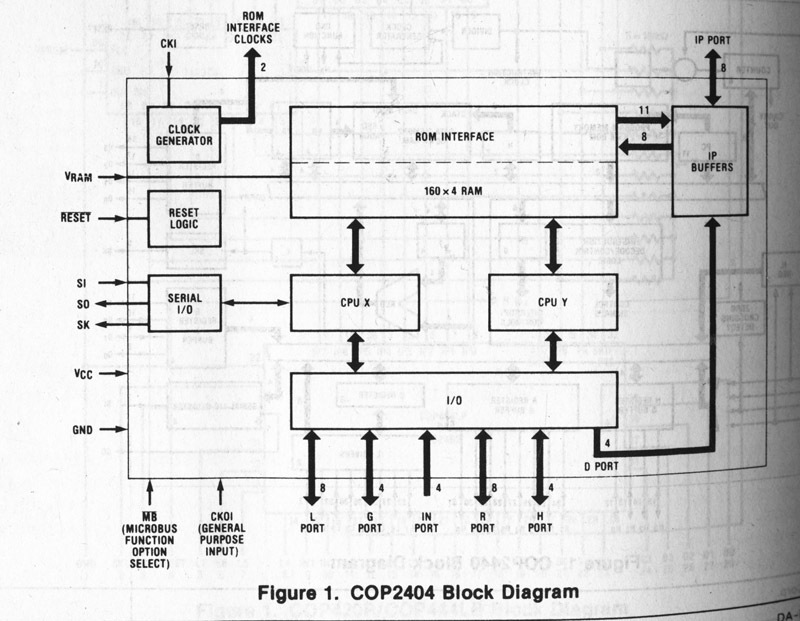 National Semiconductor introduced the COPS series of 4-bit processors in 1977. COPS came from National’s calculator line of chips, and for a short time were known as Calculator Oriented Processors, however this was rapidly changed to Control Oriented Processor System (COPS). These 4-bit microcontrollers, as their name suggests, were for controlling various consumer devices. They were used in all sorts of devices from game consoles, to dishwashers. In the early 1980s National began producing them in CMOS versions, and in 1988 they extended the line to 8-bit (the COP8 family). In 1981 the COP2404 (and 2440) were announced, with availability beginning in 1982. The COP2404 was on the top end of the COPS line, it was found that some real time control operations were better served by 2 microcontrollers, so why not design 2 into one. The 2404 is a dual core processor, with two complete COPS404 cores on one die, sharing I/O and RAM. (The 2440 also included ROM). True to multi-core form, the memory was shared, meaning the processors could work independently or pass data to each other, including task handoffs if the programmer so desired. This wasn’t implemented in hardware, but it wasn’t forbidden either, meaning a programmer could do some pretty complicated task management with the dual CPU cores. The 2404 was packed in a 48 pin PDIP, and was designed as a development device for use with external program memory (EPROM typically). Production devices were the 2440 (40 pin) 2441 (28 pin) and 2442 (24 pin) which all had 2K of ROM on die. All included 160×4 bits of RAM and had an instruction cycle of 4usec (using a 4MHz clock, as each instruction took 16 cycles). They were manufactured on a 3-micron NMOS process (originally, likely shrunk over time). As technology progressed it became easier to handle multiple real time tasks with a single, faster controller, with good hardware interrupt handling, but for a time, their was a dual-core processor. The COPS series continued to be sold by National until 2011, when they were bought by Texas Instruments. While no longer actively marketed, several members of the COP8 line are still being sold.